Understanding the different types of wine glasses and what makes them ideal for one type of wine over another is essential to getting the most out of your wine collection. In the second article we discussed the different types of wine glasses needed for the red wines and the roses and to day we will cover the white wines and other wines as well. White wines are from either "black" (red-colored) or "white" (green-colored) grapes, fermented without the skin, and are often combined with citrus and spicy flavors. A white wine glass bowl will be more U shaped and upright than that of a red wine glass, allowing the aromas to be released while also maintaining a cooler temperature. The white wine glass style that’s best for younger whites has a slightly larger opening directing the wine to the tip and sides of the tongue to taste its sweetness. The glass for more mature white wines will be straighter and taller to dispense the wine to the back and sides of the tongue to taste its bolder flavors. Sparkling wine, or champagne, adds a hint of luxury, through a fizzy/bubbly texture. The "sparkles" in sparkling wine are bubbles of carbon dioxide, which is a natural byproduct of the fermentation process. 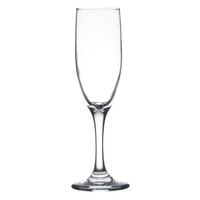 A sparkling wine glass (or champagne flute) will be upright and narrower than most wine glasses to retain the carbonation and capture the flavor in the beverage. Fortified wine is a wine that has been blended with a liquor. The liquor most often used for this is Brandy which is essentially just distilled wine. This gives fortified wines a distinct flavor and a higher alcohol content than normal wine – usually at least %15 ABV. A dessert or a fortified wine glass should be smaller to direct the wine to the back of the mouth so the sweetness doesn't overwhelm. 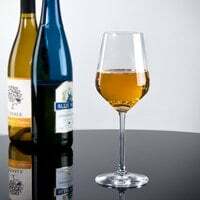 Dessert wines generally have a higher alcohol content, making small dessert wine glasses perfect for a smaller serving. The same rule of thumb applies to sherry and cordial glasses. 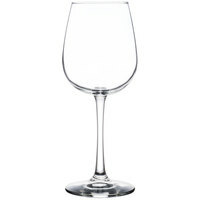 If a single glass type is all that your circumstances permit, an all purpose wine glass is the way to go. Although the experience may not be the same as when you use the proper glass type for the application, these glasses offer a similar function at a lower cost and increased efficiency. 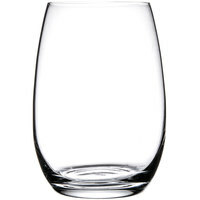 The bowl shape is in between that of red and white wine glasses, making it acceptable for use with both types of wine. Offering the same shapes and styles of bowls as traditional stemmed wine glassware, stemless wine glasses deliver function with modern style and a limited risk of breakage. Wines may be warmed faster than with stemmed glasses, but the stemless design of these pieces exudes a contemporary appearance that's all the rage and definitely worth the risk. Additionally, since the delicate stems are no longer present in these glasses, less care ought to be required to maintain them.